Though the central mitzvah of the Seder night is remembering the Exodus from Egypt,1 the night includes three individual mitzvahs as well: eating matzah, maror and the paschal lamb (the lamb is no longer eaten). Let’s delve into the mitzvah of maror, the bitter herbs. Do you wonder why we are eating this stuff? You’re on to something. During the Passover Seder, we ask that very question. The text of the Haggadah answers by quoting a verse from the Torah: “They embittered our lives with hard work.”2 The bitter taste of the herbs reminds us of the bitterness of our slavery in Egypt. By definition, maror is something bitter. But what? The Mishnah continues that both the stalk and the leaves (if using an herb that has leaves) may be used, and they may be fresh or dry. The Talmud, however, points out that this allowance for dry herbs is only regarding the stalk; the leaves must be fresh.12 The herbs may not be cooked, or even soaked for 24 hours,13 since that would cause them to lose their bitter taste. Now we get into the specific details of how to eat the maror. During the Seder nights (one in Israel and two in the Diaspora), after we have eaten the matzah, we prepare to eat maror. First, we take a kezayit (the volume of an olive) of the maror and dip it into charoset,14 a traditional concoction of apples, nuts, wine and other sweet ingredients. This was originally done to kill a dangerous worm that could be found in the herbs.15 Some say that the reason we still do it nowadays is because charoset resembles the cement we were forced to use in building the Egyptian cities.16 Although we dip the bitter maror in the sweet charoset, be sure not to let the maror linger in the charoset so as not to dilute the taste, and shake off the charoset straight away. After we eat the maror, the herbs are used one more time for what is known as the korech, a sandwich comprised of matzah and maror.23 To understand why we do this, it’s necessary to take a moment to explain a dispute among the rabbis about how the paschal lamb, matzah and maror were eaten when the Temple was standing. Most of the rabbis were of the opinion that each was eaten separately. Hillel, however, held that one would make a sandwich of the three and eat them together. To fulfill all opinions, we do both. We first eat the matzah and maror separately, and then we eat them together as the korech sandwich. At the beginning of this article,27 we stated a few things that seem to be difficult to understand. Firstly, we stated that maror is merely a “preparation” for the paschal lamb. Why is that? True, the Torah does connect them in the verse, but why does the Torah make one dependent on the other? We then said that nowadays, since there is no paschal lamb, there is no biblical commandment to eat maror—and there is therefore no reason to eat maror in remembrance of the slavery. Instead, we eat it only to remind us of the Temple. Once again, this seems difficult to understand—just because we have no biblical commandment, we shouldn’t eat maror to remind us of the slavery? Our slavery in Egypt is surely something worth remembering! To explain this, it’s necessary to take a moment to analyze the Seder night—and to embark on a path towards a deeper understanding of maror. Externally, the Seder seems split into two distinct parts. First we gather our family together and recount the tale of our time in Egypt, reliving once again one of the most defining chapters of our history. Then, when that is done, we return to the present and fulfill the physical mitzvahs of the night—eating matzah and maror. These two parts seem to have little in connection with each other. The Lubavitcher Rebbe, Rabbi Menachem M. Schneerson, of righteous memory, explains however that this viewpoint is superficial. Once we begin to analyze the Seder, we realize that these two parts share a common thread; they are the two acts of a single play, each one working in sync with the other to bring about the theme of the Seder night. That theme is remembering Egypt. First, we sit down for maggid, the step of the Seder when we use our gifts of speech, creativity and imagination to recount the story of our slavery and redemption. But that’s not enough; the story is still limited solely to our mind. So when we’re done, we take out the Passover foods to internalize that feeling of freedom through our very actions. When we eat the maror, the bitter taste grants us an appreciation for the hardships our forefathers endured, and ideally, if we were able to savor the paschal lamb, its rich sweetness would show us the freedom that followed. This is why the maror is so important. We must sense the bitterness of slavery to really taste the joy of freedom. Freedom is meaningless if one has never felt confined. Therefore, the maror is considered a preparation for the paschal lamb—its bitterness lends an appreciation for the value of the paschal lamb. Nowadays, however, we do not have the freedom of the paschal lamb. We are still confined to exile. Therefore, the bitterness of maror will not grant us a greater appreciation of our freedom—we do not yet have such freedom. On the contrary: its bitterness will only greater emphasize the bitterness of our current state. Therefore, there no longer exists a commandment to remember the bitterness of Egypt. Instead, we eat maror solely in remembrance of the Temple. Maror nowadays is a rabbinical decree, instituted to remind us of the Temple. Common herbs for maror are horseradish and romaine lettuce. Chabad uses both. Before eating the maror, dip it into the charoset and then shake it off. Make only an al achilat maror blessing, and not a ha’adamah. You do not have to lean. Eat it within 2–4 minutes. Eat it again between two pieces of matzah. Tzofnat Paane’ach, quoted in Likkutei Sichot, vol. 22, p. 46. Pesachim 2:6. See Necessities That Have to Be Prepared for the Seder for an overview of this topic. 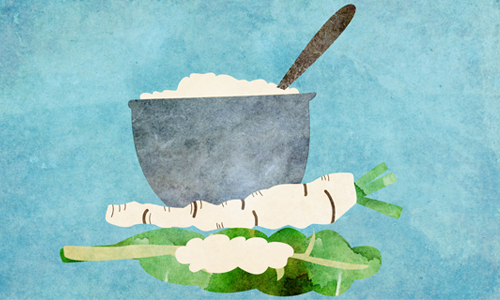 Sefer Haminhagim, Pesach: The Seder and the Haggadah. Tur and Shulchan Aruch, Orach Chaim 475:1; Shulchan Aruch HaRav 475:11. Ba’er Heitev 475:5; Shulchan Aruch HaRav 475:11. Tur and Shulchan Aruch, Orach Chaim 475:1; Shulchan Aruch HaRav 475:13. Beit Yosef, Orach Chaim 475:1; Shulchan Aruch HaRav ibid. Tur and Shulchan Aruch, Orach Chaim 475:3; Shulchan Aruch HaRav 475:25. See Shulchan Aruch HaRav 475:15–18 for a detailed explanation of this paragraph. The Lubavitcher Rebbe’s notes to the Haggadah. Whether or not to lean is a debate in halachah (see Tur ibid. ; Shulchan Aruch HaRav 475:20.) However, the halachah is that we do (Shulchan Aruch and Shulchan Aruch HaRav ibid.) See Shulchan Aruch HaRav ibid., and Beit Yosef 475, s.v. Katav Achi, for the reasoning. For the remainder of this section, see Likkutei Sichot, vol. 32, pp. 47–50. Eli Landes is a marketing copywriter by day and a fiction writer whenever he can squeeze in the time. He writes Jewish fiction and has been to known to dabble in the weird, the absurd, and the truly dark. He lives in New York where he’s working on his first novel. Follow him at Regarding Writing. maror or marror? This is great information and huge help, thanks so much! Romaine lettuce "Wash each of the leaves separately, checking very carefully for insects. " The taste of horseradish root is not at all bitter ... in fact it's significant sugar content makes it somewhat sweet. Horseradish root is very hot and pungent, which, evidently, many people erroneously consider bitter. In fact, many people erroneously call any taste they don't like bitter. Reply to Anonymous - What is Endive. You can do a search on the internet for information on endive, you will find a lot of information.